From our experiences we know that there are excellent solutions in the school system to all the issues faced by teachers, non-teaching staff, school leaders, and governors. However, as is often common in the education sector, these solutions do not reside with those who need them because methods for their transfer are often ineffective. Equip the staff and schools with the social skills to share their knowledge effectively (Social Capital). Set up the organisational systems for them to share this knowledge with those who need to learn (Organisational Capital). 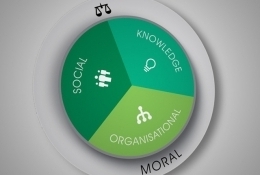 It was these four foundations of effective knowledge management, based on George Berwick’s depiction of the ‘capitals’ – moral knowledge, social and organisational, which drove the school-to-school approach to the London Challenge, and now underpins the work of Teaching School Alliances and Challenge Partners.